Wow! I am so excited about last night's TIE meeting. It was great. We had 3 students come and participate in the discussions. We had 2 new tutors come to see what we are all about. We had 14 tutors and the three of us from staff. It was great! We discussed student's preferences and tutor's issues and joys. If you are a tutor and were not able to come, I hope you will come to the next one. I was asked to try to get speakers for topics like how to work on pronunciation challenges, cultural awareness, how to use literature in class, and how to incorporate new students in established classes. I took this picture a bit before all the tutors and students arrived but then things got busy and I didn't get any more taken. ﻿OUR JANUARY TIE WAS TERRIFIC!!! We met at the Glaze for our TIE meeting on the twelfth. 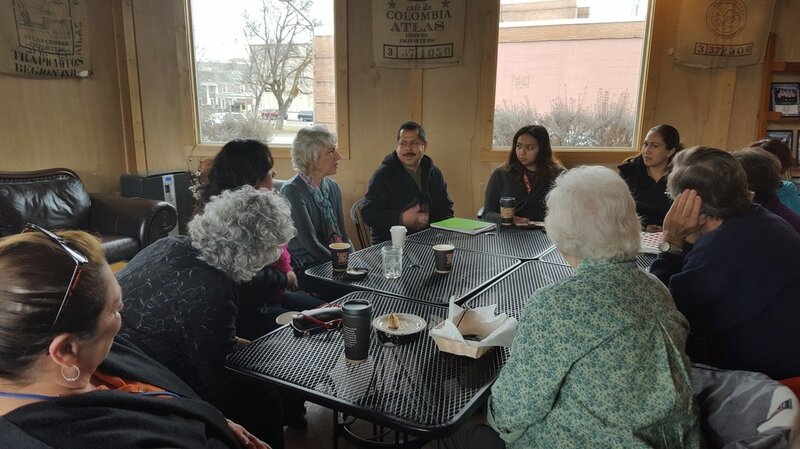 Cathy Meuret and Alma Castillo from Chelan-Douglas Health District came to speak to us about health issues and ways that we could help our students adjust to American health culture. Did you know that in some places in Latin America, mothers wrap their babies up so that they are warmer when they have a temperature? Did you know that many people in Mexico just feel a child's forehead when they are not feeling well, rather than using a thermometer? Some of our tutors brought up that their students don't measure when they cook but "just know" the amounts to put in. Cathy said we should work with our students on measuring accuracy for medicine. There were many other cultural health and homemaking issues that we talked about covering with students but the tutors that were at the TIE wanted more information. On the 9th of February we will have our next TIE meeting and hope to have a student come and share with us about life in rural Latin America on the home front. More about how they do things differently. We have a speaker for our January TIE Meeting! 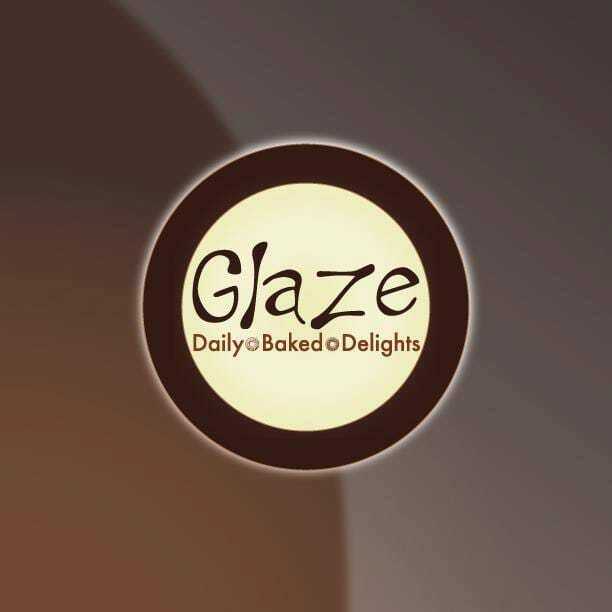 ​means 9:00 at the Glaze. ​We have a speaker coming so I would like to have a good turnout. Please mark your calendars now. Cathy Meuret manages the Health District's community health improvement program activities for Chelan and Douglas counties. Cathy is in charge of the health education program and curricula development for Confluence Health. She will be sharing with us about how you can use health information in your classrooms. As you can guess, I would like to have a good turnout for Cathy. Please let us know if you WILL be able to make it OR NOT. 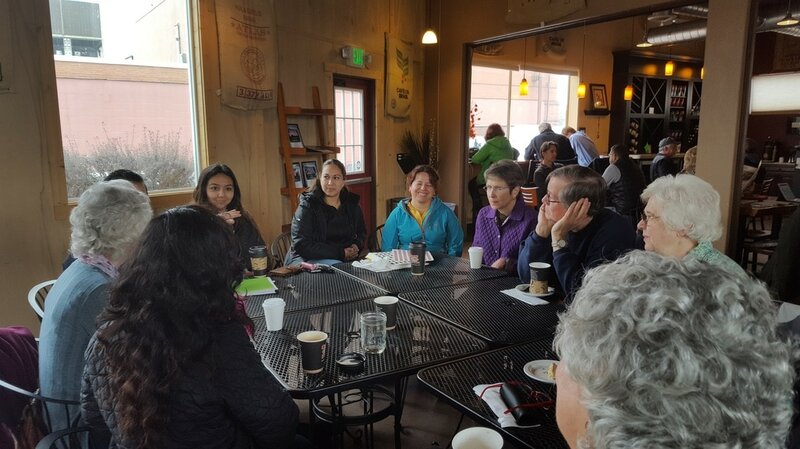 Our December meeting was sort of "on again, off again" because of the weather but in the end there were a couple of us that met at the Great Harvest Bakery. Donna Titleman, Rebecca Barrett, and Ilona Brutskaya met with Anwen and I (Kay) and we worked together to help Ilona feel more comfortable with starting her class and gave Donna some pointers on working with very beginners. It was a great place to meet and hopefully we can do it again when we have another TIE. 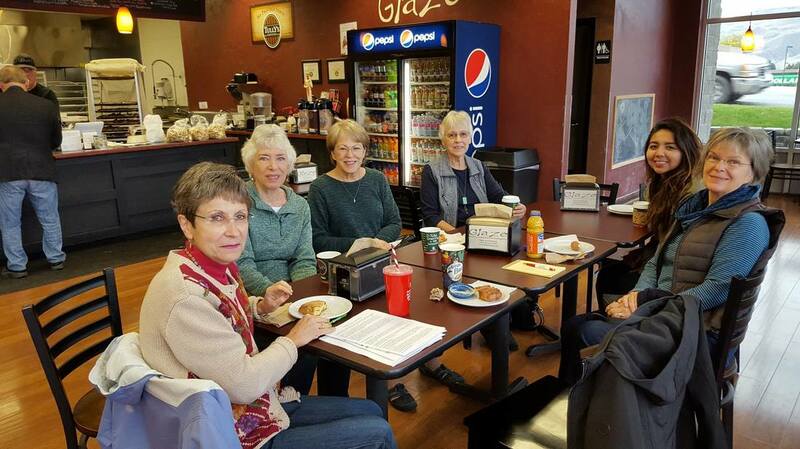 Our TIE meeting was held at the Glaze​ bakery in East Wenatchee this month and we had a great time. All tutors were invited but we only had about 6 people there. This is a Tutor Information Exchange meeting where we discuss tutor questions and exchange ideas for improving our classes. It is also just a good chance to get to know each other. The meeting was from 9:00 until 10:00 but people hung around to talk a bit after 10:00. Rebecca Barrett said, "I enjoyed, so much, the chance to bounce some ideas off of other tutors. Every tutor has their own style but hearing how others solve problems we all have was inspiring." We had a good exchange of ideas and the food was terrific. I think I am going to like having the TIE (Tutor Information Exchange) at different sites in our area. 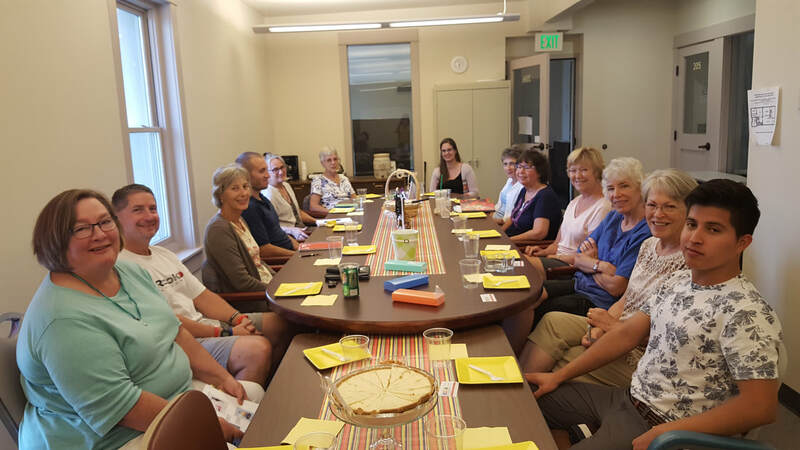 If you see a tutor that you are familiar with in the picture, ask her about the TIE meetings. Wow! It has been a long time. The summer went so quickly in many ways and now we are ready to move into a great fall season. Our second TIE meeting was last Thursday at 9:00 at Cafe Columbia. We had said that we would try this new format and the tutors who attended seemed to enjoy it. It was a little slow to start as we all got our drinks or muffins, but that was a good time to just visit and get to know who everyone is. As we began some of the tutors were talking about how the new classes were going and some talking about how anxious they were to get their new classes started. I then shared some ideas on how to use reading with your students and everyone chipped in an idea or two. I told the everyone that I would share the websites that I had visited for information so I will start with bit.ly/2e7iWM7 . This will take you to One Stop English and the article on Using Readers in the EFL/ESL classroom. As most of you know the Busy Teacher site this is one of my favorites. busyteacher.org/4035-how-to-teach-a-perfect-reading-lesson.html will take you there. It is always so easy to understand and takes a step by step approach. Ways of increasing student talk time is a subject that is often brought up at TIE meetings. These tips are from Intercambio, the people we get our curriculum from. bit.ly/2e7rUIX will give you some great tips on getting your students to talk. Not all of this information was discussed at the TIE because of time constraints but hopefully you will glean some helpful information to use in your classes. I hope it will also encourage you to come and participate at our next TIE so that you can give some feedback and ask some questions too. This type of event is always better with more people to exchange ideas. Everyone likes to talk about the things that they like, and your students are no exceptions.When we like something we are passionate about it, and we want others to share that passion. That’s why getting students to talk about their favorite things is a great way to promote discussion in the ESL classroom. More than that, everyone has different favorites, and your students are sure to disagree when it comes to what is best. That kind of disagreement also promotes discussion. So get ready to have your students talk up a storm with these simple activities that get them talking about a few of their favorite things. 1Soda-pop Taste TestWhich carbonated beverage do your students like best? What is the top choice for the class? In this discussion activity groups of five to six students will have to agree on the best cola in your very own, in-class taste test. To set up the taste test, choose three or four brands of cola and bring enough of each one to class so every student can have a taste. You will need an area to set up where your students cannot see which brand you are serving. Set up one tray for each brand of cola you will be taste testing. (You will probably want a bottle of Coca-Cola and Pepsi as well as an inexpensive generic cola and one other.) Set up four trays and set enough small cups on each tray so you have three or four more than you have students in class. 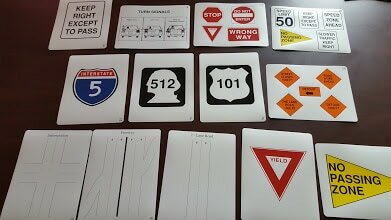 Label each tray Brand A, B, C, or D. Then bring your trays into the classroom and set them up front. Each person will take a turn tasting each of the four colas you have poured into the cups. After tasting each one, students should make notes about how it tastes and how it compares to the others they tasted. (This is where a review of comparative and superlative adjectives will come in handy.) Once everyone has had a chance to taste test each of the colas, put your students into groups of five or six. Each group must decide unanimously which the best cola is. Give them time to discuss the different drinks allowing students to make arguments for or against different brands as they choose. The goal is not so much to come to a unanimous decision as to have the conversation leading to it. The goal is not so much to come to a unanimous decision as to have the conversation leading to it. If groups cannot come to an agreement by the end of your discussion time, that is okay. Once discussion time is over, have each group share their ideas with the rest of the class. End by sharing which cola was which. 2Art AppreciatedDo your students have an appreciation for art? If nothing else they will at least have an opinion on it. Ask them to share what they think about some famous mater pieces with this activity. Start by printing off several pictures of classic art such as the ones linked in this article. You will want around ten to fifteen pictures that you can display around your room or on the front board. 'Starry Night' by the Dutch post-impressionist painter Vincent van Gogh. At the start of your activity, review with your class the name of each piece as well as its artist. Then have students draw a three by three grid on a full sheet of paper and randomly put the name of one piece of art in each square. Have each student choose which painting is his favorite and write two sentences describing the picture on the bottom of his or her paper. Then let students mingle and talk. When two students come together to talk, one student will ask the other which painting is her favorite. That student cannot give the name of the picture but must describe it by reading the sentences she wrote at the bottom of her page or by coming up with some others on the spot. Warn students not to look at their favorite painting when they describe it. The first student then guesses which painting his partner is describing. If he is right and that painting is in his grid, he can cross off that square and write his partner’s name in the square. If his guess is incorrect, he does not mark off anything. The other student then has a chance to ask him what his favorite painting is and mark it off her grid. Once a student has marked off three boxes in a row on his grid, he can sit down. Keep the discussion going until everyone has marked off three squares in a row. 3Favorites CircleThis simple game gives students a chance to ask their classmates about their favorites. Have students stand in a circle in the middle of the room. Give one student a beach ball, a wadded piece of paper, or another ball that will not damage your room if accidentally thrown wild. That student starts by asking a question about a favorite. “What’s your favorite…. ?” Then he tosses the ball to another student in the circle. That person must then answer the question before asking a “What’s your favorite…” question and tossing the ball to someone else. She cannot however repeat any question that has already been asked. Play continues each person catching the ball, answering the question, and then asking an original question of his own. If a student is not able to come up with a question or an answer, he is eliminated from the game and sits down. Play until only one student remains standing. The teacher should act as judge if there is ever a question on whether a particular question has already been asked. Whether it’s raindrops on roses or whiskers on kittens, everyone has a few favorite things.And while some may choose to sing about them, most everyone likes to talk about the things they like best. Your students will love the chance to talk about their favorites with these easy conversation activities.